Tips are a well recognised social custom for showing appreciation for exceptional service. So you've done a great job and a customer would like to show their appreciation with a Tip - let's look at how this can be received and tracked with Simple Inked. 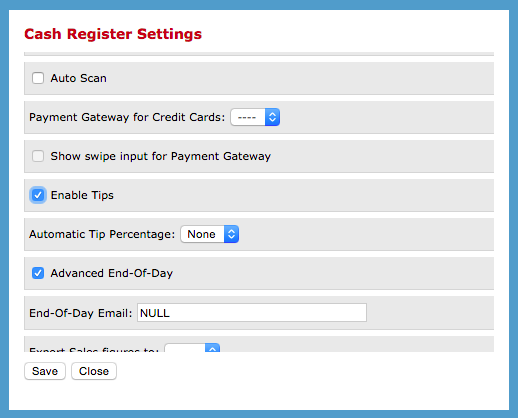 Go to your Settings, select Cash Register Settings, scroll down and tick Enable Tips. Note: You also have the option to allocate an Automatic Tip Percentage. This means that every time you use the Tip feature in POS, your Automatic Tip Percentage will be calculated and added to the bill. How to apply a Tip at POS. 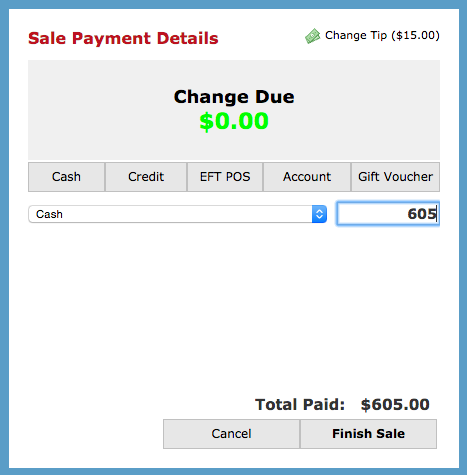 When you complete a sale in POS and Select Receive Payment, you will see the Add Tip option appear in the top right hand corner of the in the Sale Payment Details box. Click Add Tip - you will see a number of percentage options. (Percentage calculation is based on a the total sale amount currently being processed in POS). If the customer has said that they would like to give you a certain percentage as a Tip you can select the relevant percentage and click Close. Alternatively, you can use the Custom button and enter the amount the customer would like to tip you. 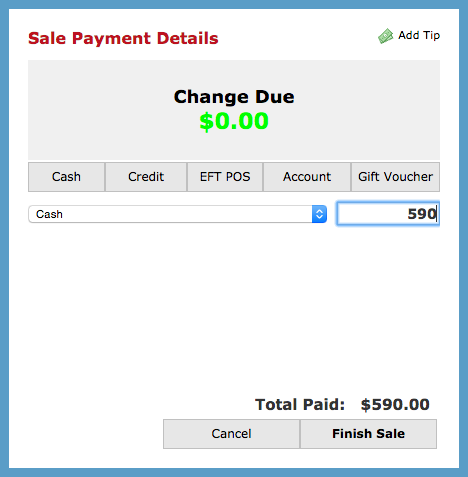 If the customer would like to give you a tip for a custom amount, click Custom and enter that amount in the field provided. Click Close to continue with sale, or select Save Tip if you would like that amount to be saved as Custom. You will now see your Tip has been added to the Sale and the Sale can be completed as normal, by clicking Finish Sale. Splitting the Tip Between Two Operators. If there is more than one operator in the one transaction, an extra option will pop up when applying a Tip - All Operators in Sale or Custom. By selecting All Operators in Sale the tip will be equally applied to all operators however if you would like to select what percentage each operator gets then you can choose Custom and move the sliding bar to the appropriate percentage for each operator. Once this is done click Save Tip and Close. Keep track of your Tips. Go to Reports and click on the Report Lists tab. Then Select Operator Report. You will see a Tips column for each operator, with the total number of tips they have received (this number will be in brackets) and the monetary amount each operators has received from tips in total for the Report Period (From Date: / To Date:).